The Maurice A. Deane School of Law at Hofstra University regularly hosts scholars-in-residence for two to four days to enhance the curriculum. Visiting scholars address students and faculty, conduct classes and attend informal gatherings with the Hofstra Law community. As a Distinguished Scholar-in-Residence, Professor Gerken was asked to write an article for the Hofstra Law Review. Her article will appear in a forthcoming issue of the Hofstra Law Review. Following its publication, you will be able to download it here. 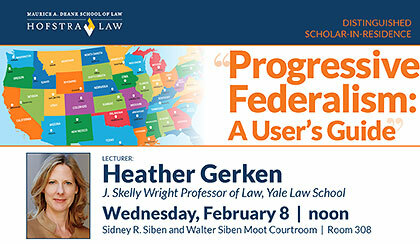 Heather Gerken is the J. Skelly Wright Professor of Law at Yale Law School. Professor Gerken specializes in election law and constitutional law. She has published in the Harvard Law Review, the Yale Law Journal, the Stanford Law Review, Michigan Law Review, Columbia Law Review, Political Theory, Political Science Quarterly, Roll Call, Legal Affairs, Legal Times, The New Republic, Democracy Journal, and elsewhere. She has served as a commentator for a number of media outlets, including The New York Times, The New Yorker, the L.A. Times, the Chicago Tribune, the Boston Globe, NPR, the Lehrer News Hour, Bill Moyers, CNN, MSNBC, and NBC News. Her most recent scholarship explores questions of election reform, federalism, diversity, and dissent. Called the “intellectual guru” of progressive federalism in the New York Times, her work has been featured in The Atlantic’s “Ideas of the Year” section, the Ideas Section of the Boston Globe, NPR’s On the Media, the New York Times, and Time. It has also been the subject of three academic symposia. Professor Gerken clerked for Judge Stephen Reinhardt of the 9th Circuit and Justice David Souter of the United States Supreme Court. After practicing for several years, she joined the Harvard faculty in September 2000 and was awarded tenure in 2005. In 2006, she joined the Yale faculty. Professor Gerken has won teaching awards at both Yale and Harvard, been named one of the nation’s “twenty-six best law teachers” by a book published by the Harvard University Press, was featured in the National Law Journal for balancing teaching and research, won a Green Bag award for legal writing, testified three times before Senate Committee on Rules and Administration, and serves as a trustee for Princeton University. Professor Gerken served as a senior legal adviser in the “Boiler Room” for the Obama for America campaign in 2008 and 2012. Her proposal for creating a “Democracy Index” was incorporated into separate bills by then- Senator Hillary Clinton, then-Senator Barack Obama, and Congressman Israel and turned into reality by the Pew Charitable Trusts, which created the nation’s first Election Performance Index in 2013. Gerken, Heather, "Progressive Federalism: A User’s Guide" (2017). Distinguished Scholar-In-Residence Lectures. 5.